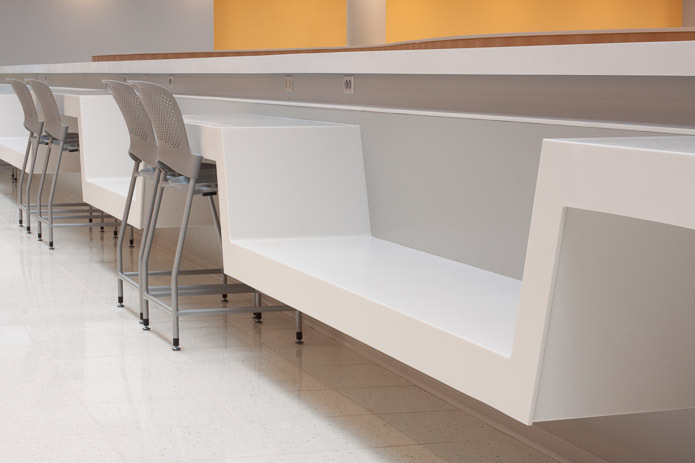 In yet another display of solid surface's unlimited versatility, Sterling Surfaces, and its partners have collaborated to help a forward-thinking architectural team bring out the best attributes of CORIAN in eye-opening fashion at an Ohio college. In the process, everyone has learned a little more how architects and advanced fabricators working together, can take solid surface to the head of the class! 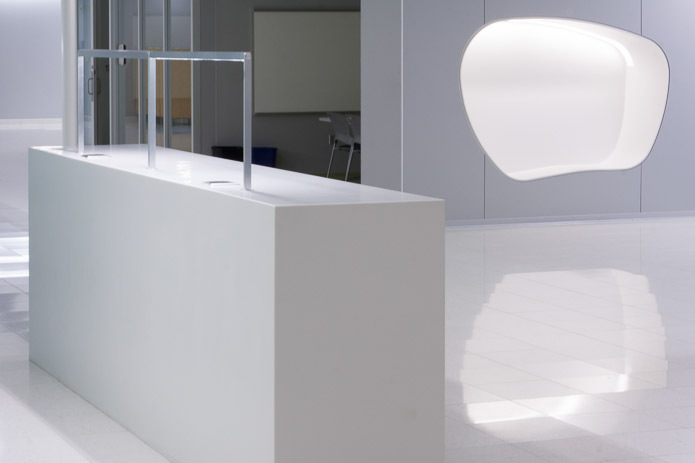 The seminal conversations about CORIAN took place long before the fabrication and installation, with Sterling Surfaces collaborating in exploratory meetings with the architectural team at Sasaki Associates in Boston. Katia Lucic, Principal, and the team asked probing questions about the performance of CORIAN and its ability to be formed and perform in these unusual applications. 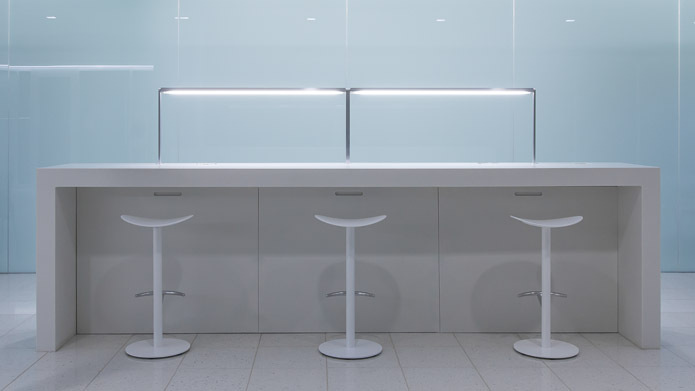 "We were more than happy to collaborate up front, even before contract, exploring how to fabricate and install the CORIAN. Collaboration included working out the challenging details on paper, support requirements, installability, and the install sequence. Those early meetings left Sasaki's team with the confidence to design the technically demanding applications into the project"
Grant Garcia, Managing Director/Sterling Surfaces. From a fabrication perspective, the collaboration only gets better. With the job bid, won and now under contract, the project schedule afforded Sterling the opportunity to partner with key fabricators to share project responsibilities. The nod went to Advanced Surfaces, Inc. of Corry, PA. and Kornibe Designs of Glasgow. KY. The three-way fabrication partnership allowed each company to bring their strengths to the table, completing the project on time. Every advanced fabrication project contains inherent learnings. The iLoft demonstrates that even 40 plus years down the road, CORIAN is still going to school! More information and photos about the Sasaki-LCCC iLoft project.